Michigan Retail Fraud and Larceny Crimes Require an Intent to Steal. 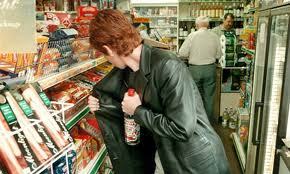 You Can Be Arrested For Larceny Even If You Have Not Left the Store! This blog will focus on whether a person can be arrested (and convicted) of retail fraud without leaving the store and discuss some trial strategies which our defense attorneys employ when contesting a retail fraud charge. The prosecutor must be prove that a person charged with a larceny or retail fraud crime had an “intent to steal.” Circumstantial evidence may be used to argue the issue of “intent” when the direct facts do not fully show a specific intent to steal. The conduct of the individual may show an intentional concealment of goods when the customer claims that the taking of goods was accidental or non-intentional. What is your opinion of the person in the picture which is inserted at the top of this blog? Intentional or non-intentional? The prosecutor would assert that this behavior is consistent with dishonesty, rather than accidental conduct. As described above, the intent to steal is the most important element of a larceny crime or retail fraud (in any degree). This means is that the person intended to permanently deprive the store of the merchandise, and not that the person actually leave the store with the merchandise. According to MCL 750.365d(1)(b), the elements of the crime (retail fraud first degree) are as follows. The law itself designates that only movement of the property, coupled with the intent to steal, is all that is necessary for an individual to be convicted of retail fraud. It is the goal of a criminal defense lawyer to advocate facts which support an unintentional taking of goods (accidental or inadvertent). A criminal defense attorney will explore the details of the charge and argue evidence that does not support the element of criminal intent to steal. In some cases video surveillance will be examined and the circumstances surrounding the taking carefully analyzed. Other evidence may include recent purchases by the shopper, past receipts or distractions which existed at the time the shopper took the goods. However, the prior criminal record of a person charged with larceny may be admissible in evidence under certain circumstances by the prosecutor. Our firm has received dismissals of larceny and retail fraud cases in virtually every Macomb County District Court. Many retail fraud cases which are handled by our firm are resolved without trial and result in dismissals as we have discussed in other blogs.